People would have choices to adjust and experiment with creating multiple layers, contrasting colours and textures in order to create photos in 3D. 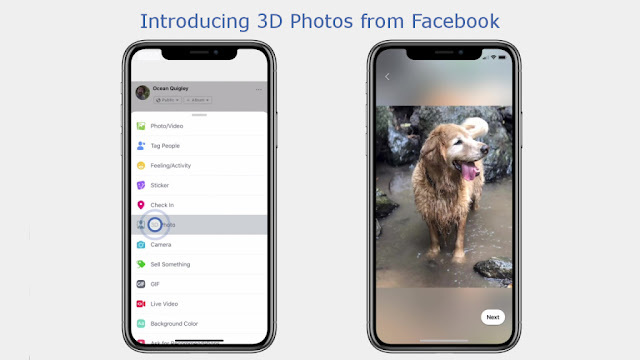 In a blog post, Facebook 360 team wrote, "Everyone will be able to see 3D photos in News Feed and VR today, while the ability to create and share 3D photos begins to roll out today." You’ll get the best results if your main subject is three or four feet away, and to really make it pop, try to capture scenes with multiple layers of depth, including something in the foreground and something in the background. Facebook says that the 3D Photos use the depth maps that are stored with “Portrait” photos taken on iPhone 7+, 8+, X or XS. "Just take a photo in `Portrait` mode using your compatible dual-lens smartphone (although it’s not present in the new, lower-end iPhone XR), then share as a 3D photo on Facebook where you can scroll, pan and tilt to see the photo in realistic 3D,"
It’s also adding yet another little feature that blurs the line between normal Facebook posts and “immersive” experiences like virtual or augmented reality. And it’s doing so in a way that’s relatively non-controversial, at least compared to the giant home videophone it unveiled earlier this week. Facebook has specified that only iPhones with dual cameras are supported, for now, not all dual-camera phones.